DAVID Gatward-Ferguson delights in telling people, particularly his fellow Brits, that he's a drop-out. "Wife's one, too," he cheerfully adds. "I dropped-out of marketing computer systems, and Amanda dropped-out from being an accountant. "And now we spend our days in the most beautiful terrain in the world. Fellow Poms turn greener than the hills around here when we tell them that people actually pay us to take them into the these mountains, to get them into the old gold-mining sites down by the rivers, and by four-wheel to places just so incredibly rich in history and folklore." 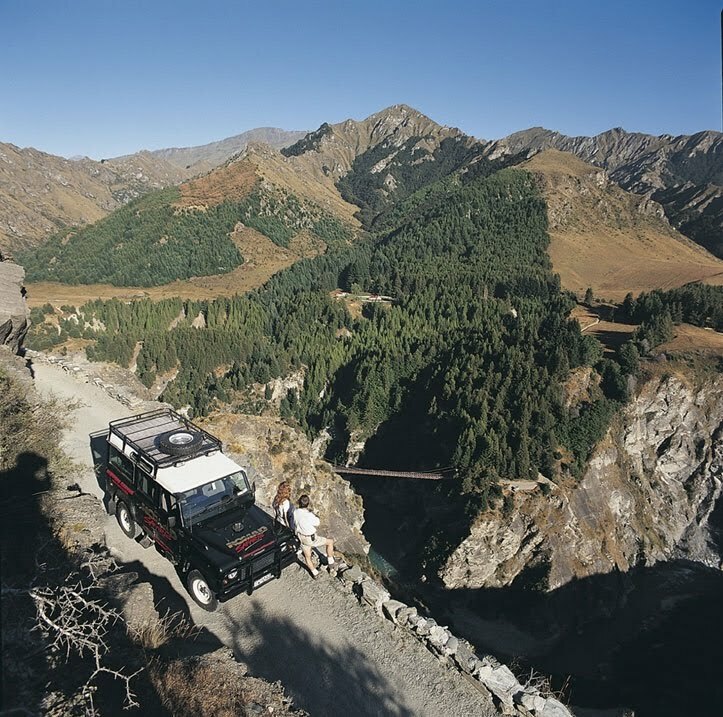 'Here' for David and Amanda is the spectacular alpine country around Queenstown on New Zealand's south island. "We'd become sick and tired of boardroom back-stabbing and bitchiness in London," David says. "So one day in 1993 we walked-out, bought two air tickets to New Zealand, and we've been here since." 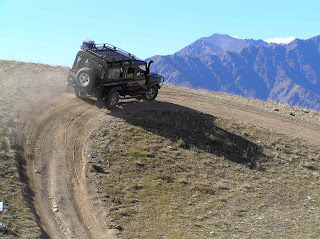 On arriving in Auckland, David and Amanda decided that a "nice long drive" would be a good way to see the country, so they bought a campervan, and weeks later ended up in Queenstown. There they came upon an opportunity to take over a company called Nomad Safaris that specialised in 4WD tours into the stunningly beautiful mountain terrain behind Queenstown – taking adventurous tourists along roads that were once little more than foot-tracks for early sheep farmers. Later these same tracks became pathways to the stars for thousands of hopefuls who flocked to the area when cries of "Gold!" rang out from creek beds at the bottom of 75-degree ravines topped by razor-back peaks. "Some visitors find the roads heart-stoppers," says David as he inches his Landrover across a muddy washaway on a section of mountain pass that's 100m directly above the Shotover River. The 32km road took 200 men ten years to build, including two years for a mere 300 metres around the almost-vertical Pincher's Bluff: to build this white-knuckle section in 1888, men were lowered on ropes to plug dynamite into holes they drilled into the schist, and would then yell to their mates at the top to haul up like crazy as the cliff face blew away below them. 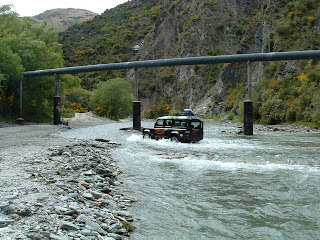 David and Amanda's tours take people through the incredibly beautiful Skipper's Canyon, so-named because when gold was found in the early 1860s, not only did crews jump-ship from vessels calling at Dunedin – so too did the skipper of one, who simply telegraphed his boss in England that as his entire crew had gone to make their fortunes, he might as well too! At one stage the mountains and rivers were yielding as much gold as the fabled Yukon. The first miners into the region, Thomas Arthur and Harry Redfern had originally walked 350km into the mountains from Dunedin to work as shearers. 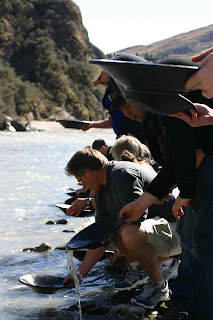 But when Thomas Arthur found a huge nugget in the Shotover River they pinched the frying pan from their boss's kitchen to go panning for more gold, and never returned. "Mr Arthur and Mr Redfern told of picking up gold by the pound," a Dunedin newspaper reported at the time. "They were laden with gold that they said lay everywhere in the canyon…"
It sparked the gold rush and twelve thousand hopefuls flocked to the area, but their new-found wealth proved fatal for Arthur and Redfern: both died of alcoholism a few years later. Nomad Safaris shows visitors the remains of such historic old ruins as the Welcome Home Hotel that catered first to the miners during the 'rush,' and later horse and carriage tourists who were as enchanted then by the rugged beauty of the mountains as visitors are today. The hotel finally closed in 1940. There's also the little mountain cottage of John Balderstone and his wife Fanny, an Irish dancer who came out to entertain the miners. They retired after the 'rush' to the quiet of the mountains, but Fanny yearned for the bright lights of Queenstown. So John struck a compromise: he built a new cottage for them half-way between their old home in the mountains, and those bright lights…. There's also a museum at the old Skipper's Town that once boasted over 1000 residents. 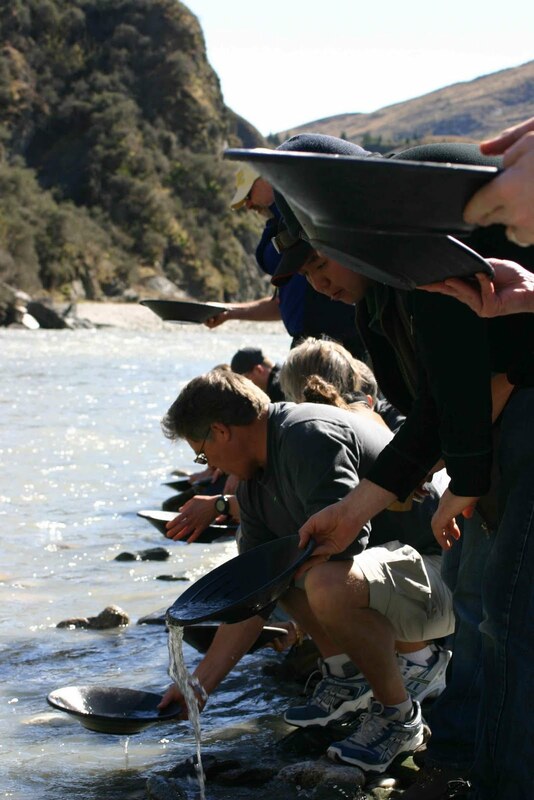 GUESTS also panning for gold in the hope of striking rich like those of the 1860s gold rush.